Certified Organic Rose Hip Oil is rich in essential fatty acids, vitamins and antioxidants, this easily-absorbed oil is a real treat for the skin. It may help smooth wrinkles, even out skin tone, reduce the appearance of acne, scars moisturize and soothe dry skin, nourish and hydrate ageing skin, balance oily skin and reduce the appearance of blemishes. This 100% Certified Organic Rose Hip oil is sourced from the Maulti Mountains of Lesotho Southern Africa where rosehips grow wild. They use both the fruit and seed of the rose hip, giving this rose hip oil a high content of the antioxidant, lycopene. The oil is extracted using a unique method called supercritical extraction. 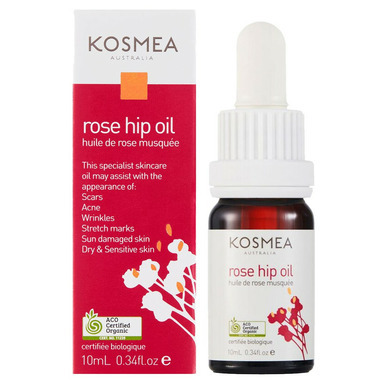 Kosmea extracts their rosehip oil without heat or solvents, keeping all the anti-ageing vitamins, essential fatty acids and antioxidants give your skin a healthy glow. The benefits of Kosmea Certified Organic Rose Hip Oil for skin are endless - it protects, repairs and adds radiance to your skin like nothing else can. 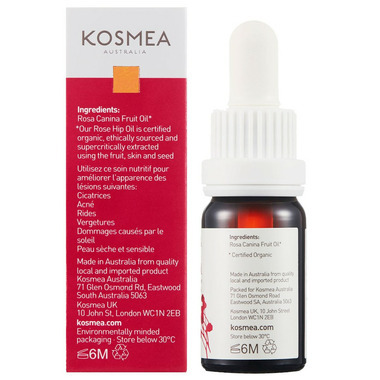 Kosmea's Rose Hip Oil is certified organic, ethically sourced and super critically extracted using the fruit, skin and seed. This rosehip oil is wonderful. I believed it saved my face from the dry itchy winter skin I was suffering from this year. I use it before bed every night. Itâ€™s quite moisturizing on itâ€™s own but you can also use it with your moisturizer. Will definitely reorder. I try to use natural skincare if I can. I had been reading that rose hip oil is great for aging skin and acne. I'm in my early 30s, but am starting to get some small fine lines...and unfortunately *sigh* still get the odd pimple. I am not a fan of the smell - very earthy - but it is nice and moisturizing, and at the same time not too heavy. I use this at night a few times a week, and my skin looks great the day after. It has worked very well, i thas helped my scars a lot and helped with my skin, i believe it is good quality. Didn't make me breakout. Haven't seen my scars lighten yet but I've only been using it for a month. Great moisturizer. I've tried several brands of rose hip oil and this is thee best. I mix it with my tinted moisturizer and it makes my skin smooth and feels great. Im 51 and have been using rosehip oil with success for about a year now. It nots not a miricle worker but it keeps my skin soft, supple and moisturized. Im happy with product. The smell is what it is. It dissipates. I bought this for my 11 year old daughter who has slightly blotchy cheeks due to her eczema condition, after using it for 2 weeks daily, we started to see that her skin tone had evened out. Amazing, I started using it too, and now notice a nice glow, and how soft my face feels on days that I use it. Will definitely recommend this product. Thank-you, Well.ca! Make my skin soft in the morning. Will keep using it. love this product! It gives your face a nice natural glow. I've been using it on and off for about 2-3 weeks now, and my skin looks smoother, plumper, and my acne and scars seem fainter. I use it underneath my regular moisturiser. Will definitely buy again! Have been using this product every night and I love it. My skin feels very soft and hydrated the next morning. I will continue to use it. It really does what it's supposed to! I put it before going to bed and the next morning my skin is all plumped and glowing! I'm glad I discovered this product, will puchase again. Love this stuff!! Initially I was applying it only to the red marks left after breakouts, and it really helps to fade them quickly. I have since started applying all over my face before bed - I was worried it might cause breakouts - but no. My skin has a nice healthy glow that I haven't seen in a long time. Will definitely keep this as a permanent fixture in my skincare routine. Lovely natural product. Doesn't irritate or clog my sensitive, rosacea-prone skin. Smells a bit like freshly cut greens, and the smell doesn't linger.